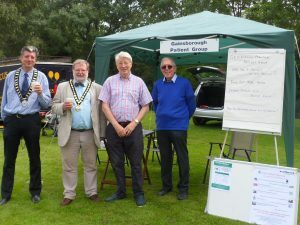 Our Patient Group had a stand at the Funday on 28th July at the Warfield cricket ground. That was to meet patients and inform them about our Patient Participation Group – as well as to get more to support our patient group. We also attended the Funday on 16th August at Braybrooke Park, and the photo shown here was also published in the ‘Bracknell News’. We gave out copies of the recent ‘Warfield Warbler’ newsletter as well as some healthcare leaflets – on Healthmakers, Extended Hours, Free NHS Health Checks etc. The practice supported this initiative and some staff (Dr Goel, Diana, and Hilary) joined us for part of the time. It was good to meet local people and patients at this event.